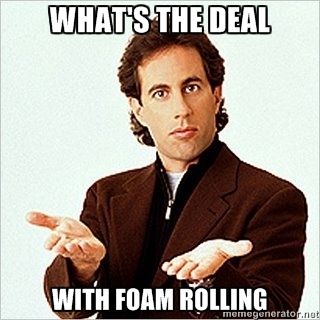 In the words of Jerry Seinfeld, "What's the deal with foam rolling?" If you've been around a gym the past few years, you've probably seen foam rollers and wondered a) what they're used for, b) are they effective, or c) are they part of some secret ninja training apparatus? Well, for those that "roll" regularly, this post will simply be preaching to the choir. However, for those of you that are new to foam rolling (or, like the 24 year old Alex, think it's a waste of time), then this post is especially for you. Foam rolling is also called "myofascial release" and it has its roots in Osteopathic medicine. The emphasis that the strength and conditioning industry has placed on foam rolling (as well as other soft tissue and manual therapy techniques) has really gained some steam over the past few years. Why? Because it's finally being realized that these techniques are helping people not only feel better, but move better as well. As I said in the video, foam rolling is just like hitting the "reset" button on your various muscles and tissues. Just like your muscles have a stretch reflex (that's if you paid attention in high school biology), fascia has the same types of properties. Specifically, there are two nerdy-sounding receptors called Ruffini fibers and pacini corpuscles, that help everything release, reset, and make you feel better (suddenly, it makes sense as it's called myofascial RELEASE). Also, it's important not to roll too fast, as the receptors in your fascia need time to adjust and do their thing. If you find yourself rolling across a foam roller at the same speed that you would tackle a water slide, then you're not going to get that much out of it. Foam rolling should never hurt, but it should be uncomfortable. When should somebody foam roll? It depends. I suggest foam rolling before any type of training, and if someone wanted to roll after a session, that would work pretty well too. And, on snowy weekend, I've also been known to turn off "Homeland," change into some sweats, turn on some country music, and spend the next 5 minutes just rolling out. What do you have to lose? Give it a try, and happy rolling!